Item Number: 10-09 1079 Actual Weight: 28 lbs. Everything you need to create professionally packaged products. Simply insert item in between film folds, lower bar to cut and seal, and use heat gun to shrink. 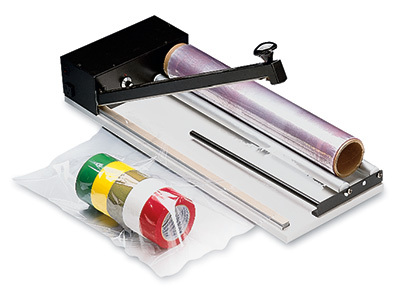 System includes heat sealer bar/film dispenser, two-speed heat gun, and a 22" x 100′ roll of 75 gauge PVC centerfold shrink film. Bar sealer’s safety-heating element only functions when bar is lowered; uses standard 110/220v outlet. Plug gun into main unit. Includes two year manufacturer’s warranty. Call for details about heat sealer service kit. Additional PVC film rolls from 10" to 22" wide also available.